This salad is so pretty to look at, easy to create, and incredibly healthy for your brain, your blood, your whole body really! In a large bowl, combine kale, lime juice, 1 tbsp mushed avocado and 1⁄2 tsp each salt and pepper. Use your hands to massage mixture into kale, until leaves have wilted just slightly. Transfer to a serving platter. (If you’re in a hurry to serve this you can chop the kale quickly rather than tear it). Prepare dressing: In a blender, combine all dressing ingredients and 3 tbsp water (more or less as needed) and blend on high until smooth, about 1 minute. Taste this and see if it needs anything – more ginger, honey or salt, maybe a dash of tamari… As with any salad dressing you need to make it taste the way you like it – never just follow the recipe! Gently mix 2/3 of the dressing with broccoli florets, red cabbage, avocado chunks, and apple and spoon over top kale. Top with pumpkin seeds, fresh blueberries and any sprouts you have (optional so don’t sweat it). If you’re not vegan you can add feta cheese. Drizzle remaining dressing over top of your gorgeous creation and enjoy! 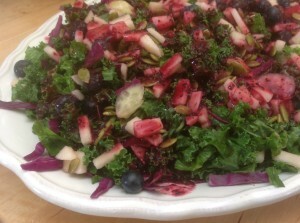 This entry was posted in Recipes and tagged Blueberry, kale, low-fat, Salad.